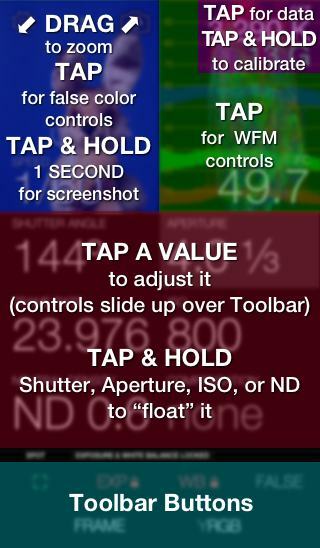 This page describes Cine Meter II version 1.21 or later. Earlier versions are similar, but not all controls are the same, and some features described here aren’t available. Cine Meter II uses buttons to change what the displays show, and taps on the displays to change how it’s shown. Cine Meter II also has a Help and Settings page (called Settings and Info in versions 1.5 and earlier) for less frequently needed tweaks, as well as built-in help. 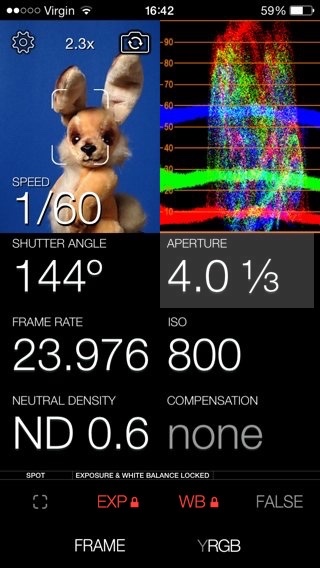 The screenshots show Cine Meter II as it appears on iOS 7 and up. Cine Meter II also runs on iOS 6, but the appearance of fonts and buttons will differ from what’s shown here. displays the Help and Settings screen. switches between “sensors”: the back camera, the front camera, the front or back camera with Luxi™, and/or Lumu™, depending on which cameras your iDevice has, and whether you’ve enabled Luxi or Lumu (the icon doesn’t appear on iPhone 3GS, or on iPod Touch 5G 8GB if Luxi is disabled). LOG appears on the left side of the picture when logging is enabled. Use it to start and stop log recording. turns spot metering on and off. The “spot” is shown as a framing target onscreen. When spot metering is off, the status line at the bottom of the meter window shows “MATRIX”, and is gray. When spot metering is on, the status line shows “SPOT”, and is green. Spot metering affects camera exposure, waveform monitor levels, and light meter readings only; it does not change the area of the picture that is displayed onscreen or measured in the waveform monitor. Spot metering only affects exposure measurement, not white balance or color measurement. (Exposure Lock) locks and unlocks the camera’s exposure along with the meter’s exposure and color-temperature readings. When Exposure Lock is unlocked, tapping it turns the entire screen into a lock button: tap the button to “arm” Exposure Lock, and then tap anywhere to freeze the reading. When locked, you can still change the meter’s settings and the floating value will change appropriately, but the overall exposure level is frozen. Tap the button again to unlock the reading. When exposure is locked, the status line at the bottom of the meter window shows “EXPOSURE LOCKED”. When the full-screen lock button is visible, a DIFFERENCE MEASUREMENT switch in the top left corner lets you turn Difference Measurement on, or leave it off for visual exposure comparisons. (White Balance Lock) cycles the camera’s white balance between unlocked (continuous AWB), locked (WB is frozen), 3200 K (tungsten) and 5600 K (daylight) settings (3200 K and 5600 K settings require iOS 8 or higher). On iOS 8 or higher, you can use Settings > Show Camera WB to display the color temperature and tint values the camera is using. WB only affects the camera’s picture and WFM images, not color-temperature readings. If you use to grab the color balance while looking at a white or gray card lit by your reference lighting source, you can then use the RGB waveform monitor to view relative color balances elsewhere in your scene, or check the purity and separation of your greenscreen or bluescreen backgrounds. When white balance is locked, the status line at the bottom of the meter window shows “WHITE BALANCE LOCKED”. FALSE turns the camera picture into a monochrome view with color-coded brightness levels. You can customize the false-color levels shown. FRAME / LINE toggles the waveform monitor between full-frame and single-line modes. FRAME mode measures brightness across the entire picture, while LINE mode measures the brightness across a single horizontal “scanline” running across the center of the picture. When LINE is selected, a guideline halfway down the picture monitor shows the line that’s being measured. Tip: LINE mode uses less battery power than FRAME mode does and may increase run time as much as 30%. / / sets the waveform monitor to show a brightness or luma (Y) signal, RGB levels, or both luma and RGB. You can move the false-color sliders while watching the image; the frame rate will drop while you adjust the levels, but you’ll still be able to see what you’re doing. To disable red or yellow false color, slide its slider all the way to the right (“above 100%”). To disable blue, purple, or green, slide its slider all the way to the left (“below 0%”). SHOW WFM CONTROLS: tap the WFM. Intensity and Overlay controls slide up over the toolbar at the bottom of the screen. Tap again to hide controls, or wait 3 seconds. ADJUST an EXPOSURE METER VALUE: tap it. Any value with a black background, except exposure value, can be adjusted. Adjustment controls slide up over the toolbar at the bottom of the screen. Tap again to hide controls, or wait 3 seconds. As you adjust any value directly, the floating value with the gray background will also change, even if exposure is locked, so you can play with different settings and see how they affect the floating value. “FLOAT” an EXPOSURE METER VALUE: tap & hold it. The floating value changes with the light, while you set the other values (in traditional shutter-priority metering, aperture floats. In aperture-priority metering, shutter floats). You can float Shutter, Aperture, ISO, or ND. When you float a value, its background turns gray, or red or purple if the floating value is outside the range that can be shown. When you tap & hold a value you can’t float, like Frame Rate, nothing changes: its background will remain black. SHOW COLOR CORRECTION PANEL: tap the color info. The color correction panel slides up over the toolbar at the bottom of the screen. Tap the color info again to hide the panel. SHOW COLOR CALIBRATION CONTROLS: tap & hold color info for 2 seconds. The color calibration panel slides up over the toolbar at the bottom of the screen. Tap the color info again to hide the panel. SHOW LUMU COLOR TRIM: tap the Lumu logo, if Color Trim is enabled in Settings. The Color Trim controls slide up over the toolbar at the bottom of the screen. Tap again to hide controls, or wait 3 seconds. The 1st box shows the metering mode. The 2nd box tells you when exposure and/or white balance are locked. UNDER - TOO DARK appears when the light level is too low to meter, or your exposure settings require a floating value beyond the limits available in Cine Meter II. The floating value’s background turns purple when UNDER - TOO DARK appears. OVER - TOO BRIGHT appears when the light is too bright to meter, or your exposure settings require a floating value beyond the limits available in Cine Meter II. The floating value’s background turns red when OVER - TOO BRIGHT appears. computed brightness appears when Cine Meter II is computing light levels from the camera’s exposure settings and picture content instead of using the camera’s brightness metadata. (Some iDevices don’t provide correct brightness information, so Cine Meter II computes it automatically instead. You can also force Cine Meter II to use computed brightness if a future iOS update makes brightness metadata unavailable or inaccurate. More info here. low power mode appears when Cine Meter II is using a lower frame rate and slower waveform monitor updates to save power. Low Power Mode can be enabled in Settings, and is enabled automatically on iOS 9+ when your iDevice is in Low Power Mode. WAITING FOR LUMU... is shown when you’ve selected the Lumu incident meter, but the Lumu isn’t attached or isn’t recognized. Plug a Lumu into the headphone port, or unplug and replug it. Help shows a simplified version of these support pages. Send Feedback opens a new email message, with the address and subject already filled in. Send me your comments, suggestions, feature requests, questions, and/or bug reports, and I’ll respond as soon as I can. Shutter Speed Increments lets you choose how shutter times are shown: by half, third, or fourth-stop increments (When not in Still Photo Mode, cine-appropriate times of 1/12, 1/15, 1/24, 1/25, 1/48, 1/50, 1/96, and 1/100 sec are always shown regardless of increment setting). You can also choose when the shutter display changes from decimals to fractions: below 1″, like Nikon and Panasonic; below 0.4″, like Sony; or below 0.3″, like Canon and Pentax. by number of stops of filtration (e.g., 2 stops). Spotmeter Frame gives you choices for the onscreen spotmeter frame color. Use English Units displays illuminance in foot-candles and luminance in foot-Lamberts, instead of lux and candelas/m² respectively. Use Shutter Angle shows shutter angle instead of time in seconds. Shutter angle combines with frame rate to determine shutter time. Shutter speeds are those used in still cameras; cine-specific speeds are not shown unless they naturally occur in the shutter speed's progression. Overexposure Warning sets the level at which the exposure-difference readout background turns red. Slide all the way to the left to turn it off. Highlight Warning sets the level at which the exposure-difference readout background turns yellow. Slide all the way to the left to turn it off. Underexposure Warning sets the level at which the exposure-difference readout background turns purple. Slide all the way to the left to turn it off. Enable Front Luxi allows incident-metering mode using Luxi™ on the front camera (the one facing you). Luxi is an integrating photosphere(see the Luxi website and the FAQ for details). Use on the main screen to select incident metering after you’ve enabled Luxi. Luxi is a trademark of Extrasensory Devices. Enable Back Luxi allows incident-metering mode using Luxi on the back camera (the one facing away from you). Enable Lumu allows incident-metering mode using Lumu™, an incident metering device that plugs into the headphone port (see the Lumu website and the FAQ for details). Use on the main screen to select incident metering after you’ve enabled Lumu. Note: enabling Lumu mutes your headphones during Cine Meter II use, and may reset your volume to maximum. Do not enable Lumu unless you are actually using Lumu, and carefully check your headphone volume afterwards. Use Lumu Color Trim lets you fine-tune Lumu’s readings based on the color temperature of the light (Lumu is slightly more sensitive to green light and daylight; slightly less sensitive to tungsten; and even less sensitive to saturated red light). More Shutter Info shows an additional shutter readout so that you can see both time and angle simultaneously. Show Luminance enables luminance (brightness) readings in reflected metering modes. Levels Reminder displays “Picture and waveform levels often do not match meter readings” when Cine Meter starts up. It’s a cautionary reminder so you won’t compare waveform monitor and false-color levels directly to the light meter readings, due to limitations described here. You can turn off the reminder, but then it’s up to you to remember these limitations and not be fooled by them. Show LOG Button enables a LOG button on the left side of the picture. Tap the LOG button to start logging. The button changes to a red REC button while the logging is in progress. Tap it again to stop logging. Log Interval sets the time between data points, from 1 to 60 seconds. Logs displays a list of log recordings: tap a log to get viewing and sharing options; slide left on a log to delete it. Exposure Calibration lets you adjust exposure to match an external meter, but it is easier use the “Cal…” button on the Compensation slider (hold your iDevice in portrait mode to see the Cal… button). Low Light Mode lets the iDevice’s camera slow down to 1/2 or 1/3 second exposures in low light. Sensitivity is improved by 2.5 to 3 stops, but the picture and WFM update more slowly in low light, and exposure readings may take longer to stabilize in bright light. The camera’s slowest shutter is 1/15 second when Low Light Mode is off. Low Light mode does not affect Lumu readings or sensitivity. Show Debug Window shows technical data overlaid on the picture. This can be useful in tracking down problems; if you contact me for tech support I may ask you what shows up in this window. Normally leave this turned off.